A lot of people forgot backing up their data files until they lost all files. Don’t let the data losing happened, if you don’t want to lose your documents, digital photos and private files, get started backing up today. 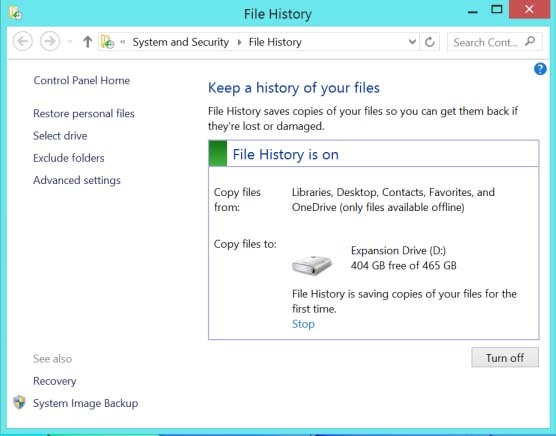 Windows 8 built backup tool is called File History, this is easy personal backup application. It allows the user to build a files history for restore when the file lose. Windows 8 require your use USB external hard disk or NAS device to build backups of File History. Plug in your USB external hard disk drive and open the Control Panel, find the System and Security, File History and setup the USB drive use for file history. Then Windows 8 will automatically backs up your files from the personal folders. Please note, you should ensure you files are all saved in these folders. By default setting, File History runs every hour when the external drive is connected. it’s often easiest way to use the simple tools built into windows itself, backup files to USB external hard disk is good and simple way to protect your data lose, but if you dislike the Windows internal backup tool due to some reason, you can easy find more third-party backup tools from Internet, more of them are all support backup files to USB external hard drive, like Automatic USB Backup, back4all, etc. Suggestion: In order to get really safe and risk-free, it’s better to build two backups of your important files and keep them on different locations. Which backup media should you use? Data backups are necessary because of the possibility of computer failure. Which backup media should you use? Today, Blank CDs are cheaper and backup data onto CDs is easy and simple, but the CDs like the floppy disks, they have a limited shelf life, you may facing the experience of putting a CD into a drive, but find that the data is unreadable. So I don’t recommend this method of data backup. Tape backup is good and reliable best backup method, but the tape drives and media are too expensive, some small business and individual can’t afford it. I recommend small business and home user to using an external hard drive for their data backups, the hard drives are cheap and also easy to use, combine a good backup software all you have to do is just plug the hard drive into your computer’s USB port, you can easy find some simple data backup software only for USB external hard drives from Internet. In addition, nowadays the hard drives failure rate is much lower, one external hard drives maybe can work well about 3-5 years. Today you can easy find many companies offering online backup services, but I don’t recommend this method, because the problem is bandwidth and security issues, if your backup data is sensitive, like business files or private photo, would you want to put it on the Internet?